Jessica and the gang over at Casual Connect (the spry little casual games conference that's been growing in size and depth while also touring all of Europe's red light districts) has posted a TON of content from past conferences over at their website here. Well worth perusing if you are interested in learning about trends in this part of the games industry. I have a ton of stuff to blog about this year's GDC, but a couple quick ones while I have a few moments. Top Secret Dance Off: An ARG/MMO/SocialNetwork/InsertBuzzWordHere where players replace the clicking-grind of most MMOs by instead upleveling through the accomplishment of Top Secret Dance Quests, usually involving dancing in disguise in a specific way and/or place. For example, let us look at top secret dance quest #3: Dancing in a Crosswalk, and then acknowledge that Jane's just added a little pinch of awesomesauce added to the universe. Miegakure: An EGW entry by Marc Ten Bosh, this was a prototype of a game taking place in four dimensions, and it broke the brain of about half the audience members. Tricky to explain without a video, but here's my attempt: The Kuju PSP game Crush (video) is a game taking place in a 3D world, but where players can play the world as a 2D game along a choice of axis (e.g. XY, XZ, or YZ). Miegakure takes the concept a step further by taking place in a FOUR dimensional world, but allowing the player to at any time play along three of these axis (e.g. XYZ, XYW, XZW, YZW). Rotating between spaces would cause the 3D world to sort of fold in upon itself before displaying the other view, and at that point my brain snapped. As Marc pointed out, the math for programming this kind of thing is kind of trivial, but I'd imagine getting your level designers to grok it would be trickier. I should note that both Jon Blow and Chris Hecker appeared absolutely giddy when Marc was demoing his game. Schoolgirl giddy. Musaic Box: An IGF entry that at first glance looks like well-polished but generic casual puzzle game. However, it involves matching patterns, colors, shapes AND MUSIC. That last element makes it unique, and shows that there's plenty of room for innovation in the spaces where established genres meet. OnLive: Lots of talk about this subscription-based, cloud-computed console entry. There's a bunch of reasons why I'm skeptical of their chances. A lengthy post on this in the future. However, I'm listing it as one of my favorite things because it's great that a startup can come out of stealth mode and surprise everyone with a credible entry into the console space. A great example of how there is always room for disruptive tech to shakeup a market. Polygon G-Men is really sweet. Go play! A friend of mine had been working on a title that was all hush-hush until this past week's release. It's a Watchmen license, called Watchmen: Justice is Coming, and is an iPhone game. What's more, it's an MMO, and for the time being, is just 99 cents. For starters, it's worth the 99 cents just to see the state of the art of 3D rasterization on the iPhone. The intro flythru with it's 8 bit alpha textures, shiny reflective wet streets and point sampling is very retro-early-90's-PC, but is nonetheless impressive. It's also quite a feat that they have a functional MMO, with realtime-ish interaction with other players (see them in the world, turn-based fighting, etc). I'm not a fan of MMOs, and this certainly is one. There's a lot of walking, and a lot of collecting of stuff. However, I like this better than many, as its a sort of minimalist MMO. No WoW UI craziness here. Beat dudes, level up, get bitchin outfits, c'est tout. Anyhow, be sure to check it out. It's certainly ground-breaking for an iphone title. I'm not sure what they had to go through to get an MMO working on the platform, but if iTunes were to allow in-game transactions and open the door to item-sales models, this could really be huge. Globetrotter XL is a really compelling geography trivia game. Puts up a world map, displays one location name after another, you click where you think it is and are scored by how far off you are. Easy enough when it displays San Antonio, USA, but when it's a city in Estonia? or China? Anyhow, real fun. I can't seem to get past level 4 (yet). I missed the DICE conference this year, but like much of the blogosphere I got a second-hand accounting of the more interesting talks at sites such as Gamasutra & GamesIndustry.biz. Among the talks getting some coverage was that of Paul Raines, Gamestop's CEO, in which he defended their controversial (within the industry anyway) practice of selling used games. Among those reacting to the talk was a good reaction from Dave Perry on VentureBeat. This isn't a new debate, of course. (e.g. Here's a thread from back in 2005, when Epic's Mark Rein was on a tear about it). Two things seem to have changed about the debate this time around. First, the industry seems to have decided that it's in bad taste (or just politics?) to argue against the consumer's right to re-sell their games. Thank goodness we're not the music industry :-). Perry and others are instead arguing against GameStop's practices of promoting the used title over new, while at the same time pulling all the usual retail practices of charging publishers at every turn to promote the very products they are steering consumers away from the new versions of. The second thing that's changed in this debate, and is really the subject of this post, is that the field just got real crowded for Gamestop, as Best Buy, Toys R Us and *shudder* Amazon are all cannonballing into the used-game pool. I share the same concerns that many do, in that I want as much money flowing back to developers & publishers as possible, and that means making the channel as efficient as possible. If we assume that used game sales aren't going to go away (I don't beleive they should, and they very likely aren't) then it's a question of how we improve the situation for those creating the content. One way of course, is to leave the retail business, and move to digital distribution, services businesses, etc. That's the subject of another post. For those intent on offering boxed product like today's, what do we do to improve the situation? The answer, I beleive, is in competition. Being essentially the only game in town for those looking to trade their games in for new (or used) ones has been part of what's made Gamestop the powerhouse that they are. Consumers will get more for their used games. In fact this is already the case with Amazon. At the very least this means the perceived value of games vs other entertainment goes up, and this may translate into more gaming share-of-wallet. Competition may mean that used games need to compete between retailers, not just with new, driving that price down. Versus today, where 1 week after release, a hit title often only has a 3-5% delta between new and used. The net effect of the latter of the two points above is that if used titles sell for less and the retailer needs to pay the consumers more for them, they won't continue to be the high margin product that they are today - the very thing attracting all these retailers to the used game space! At that point, retailers will need to compete, and not just on what they pay out to consumers for used titles, but compete for publisher business, allocation, etc. That may amount to a share of used game sales, windows of exclusivity for the new titles, better pricing... who knows. At the end of the day, it will help if both consumers and suppliers have choice, which is just what competition brings to the table. Edge published their list of the 100 most important people in game development. While it was nice to see some friends make the list, there were also some weird entries and folks missing that should have made the list. Anyhow, congrats to Robin, Trent, John, Clint and everyone else on the list. 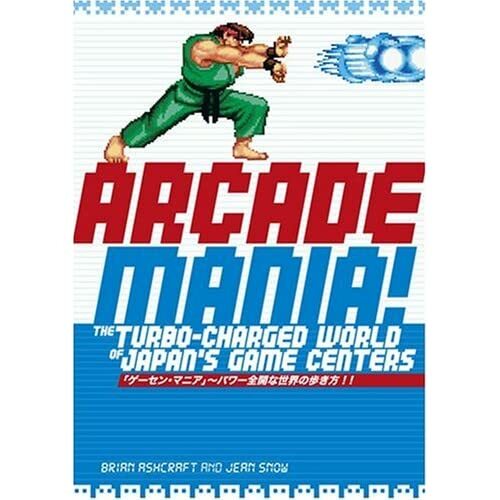 Over vacation, I finished Brian Ashcraft's little gem on the Japanese arcade scene, Arcade Mania: The Turbo-charged World of Japan's Game Centers. It's a great little book, despite a few flaws. On the plus side, Brian gives a perspective on the less well travelled (at least by gaijin) corners of the Japanese arcade scene. Not just the story behind the well known hits from Miyamoto & Suzuki, but the story behind arcade Mahjong, the history & culture behind the sticker-picture machine craze, and more. In addition, he makes it infinitely more colorful and readable by making it a story about people. Many western gamers have heard of Fatal1ty or other FPS players at the top of their game. In Arcade Mania, Brian introduces us to characters like Yuka Nakajima, queen of the mechanical claw games, whose prize-snatching prowess has netted her 3500 of her favorite stuffed animal and a role a consultant and celeb with the machines' manufacturers. He also introduces us to a pro Mahjong (real and video) player, a retired 2D fighter champ in his 20's, and to some figures from the Doujin software scene in Japan (think indie bands selling casettes from a car trunk, only it's game developers and it's schleping home-created boxes in Akihabara). All of this underscores just how broad a spectrum gaming covers in Japan and how differently it traverses Japanese culture compared to that of the US. There are also some well researched bits of history behind the technical progression of sticker-booth machines, the history of companies like Sega and others, as well as the influences between genres of arcade machines. I have two complaints about the book. Neither of which should stop you from purchasing it if the above paragraphs seem up your alley. First, it felt like some of the latter chapters, while they were ok, weren't nearly as well researched as some of the earlier chapters, and didn't really tap the same kind of cultural vein as the other ones seemed to. In the retro gaming chapter, for example, he mentions G-Front, an Akihabara store that carries old arcade cabinet PCBs and other parts, and profiles one of the employees. He doesn't though, explain whether this is the only one of it's kind, or one of a thousand. How widespread is this retro-gaming trend? [A few years ago, Doug Church dragged me through Super Potato and a handful of other places looking for an old cartridge version of one of his games, so I'd seen that there's apparently a fair number of such stores]. The second complaint is that I really would have liked to have seen Brian wrap up with a chapter speculating on the future of Japanese arcades and arcade games. Instead the book wraps with an interesting chapter on video-game/card-game hybrids, and then leaves us hanging. Given his level of knowledge, he's in a better position than most to give us a hint or two of what might lie in the future. Then again, perhaps he's seen enough of the wacky Japanese video game scene to know that the future holds things more bizarre than he's likely to dream up. In any case, these are minor flaws. The book is a good read for anyone interested in the Japanese game business and arcade scene, as well as games in general. Go pick it up.